“The train is coming” was an oft-repeated phrase at Tuesday night’s meeting on the future of Bergamot Station, the roughly six-acre City-owned arts complex in the heart of SaMo’s former industrial corridor. 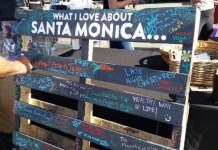 Home to dozens of galleries and other creative spaces, the area will also soon be the site of one of three stops in Santa Monica on the Expo light rail line, which is expected to carry up to 40,000 riders a day between the beachside city and Downtown L.A. when it opens to the public in early 2016. About 120 people crowded into the theater space in the back of the Writers’ Boot Camp building on the western edge of the complex to hear from three development teams competing to revamp the property into a thriving cultural destination along the Expo line. “This is about which team you think will take us in a direction you want to go,” said Jeff Worthe, president of Worthe Real Estate Group, one of the three teams in the running. 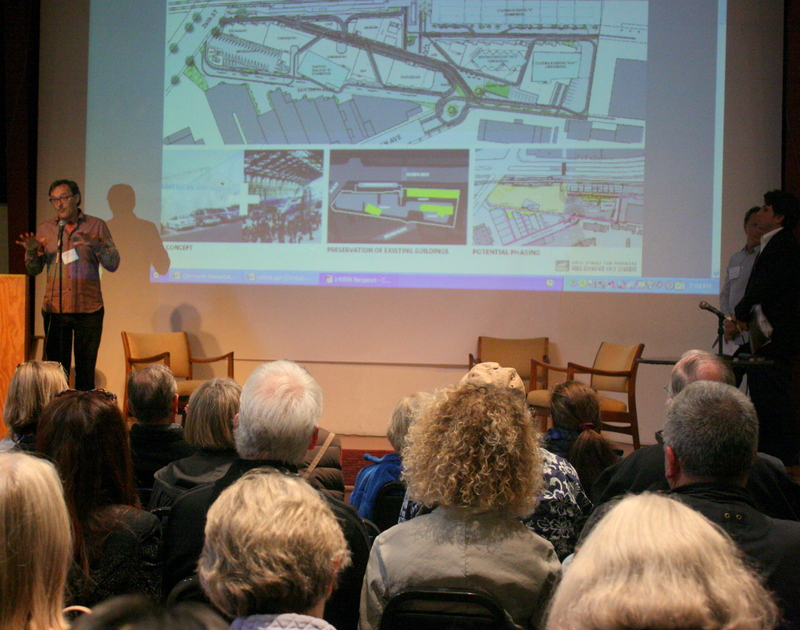 While the proposals by the three teams – Bergamot Station LTD/Worthe Real Estate Group, 26Street TOD Partners, REthink Development/Kor Group – differed in the details, their goals, guided by the City’s Bergamot Area Plan, were ultimately the same: preserve low-cost spaces for the arts, create a new building for the Santa Monica Museum of Art (SMMOA), provide open space, include a mix of uses “such as hotel, restaurant and bar, and other creative office and cultural uses” and build parking. At the City Council’s February 25 meeting, staff recommended that the Council select 26Street to develop the property, but the Council voted to get more public input before deciding which of the three development teams to choose. The three proposals would all add about 159,000 square feet of building space to the site’s approximately 62,000 current square feet. All three teams proposed between about 40,000 to 50,000 square feet of creative office space for the site. The relatively higher rents paid by the tenants in the office space, Worthe said, would help subsidize the gallery spaces. Tuesday’s meeting got a little rocky when the crowd – a number of whom sported badges with the name of the city’s most recent anti-development group, Residocracy – began shouting down the idea of including a hotel on the property. Residocracy, a vocal opponent of the controversial Bergamot Transit Village development proposed for the abandoned Papermate factory across the street from Bergamot Station, was joined by members of another anti-development group, Santa Monica Coalition for a Livable City (SMCLC) Tuesday night. “We have enough hotels!” someone shouted, while others simply shouted, “No!” at the mention of the hotels. Bergamot Station LTD’s plan includes a seven-story, 120-room hotel, while 26Street has proposed a six-story, limited-service hotel with 93 rooms and REthink wants to build a six-story, 125-room hotel. The City asked all of the teams submitting ideas to include small hotels as part of the project because hotels help keep the area active both during the day and at night. 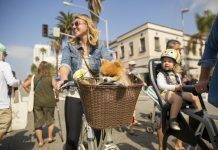 Hotels are also major financial contributors to the City, since the taxes they pay make up 14 percent of Santa Monica’s half-billion-dollar General Fund. The other flashpoint Tuesday was parking, which is essential to preserving the “fragile eco system” that is Bergamot Station, said Bill Turner, chair of the Bergamot’s Tenants Association. Turner expressed his concern that without adequate parking, patrons of the art gallery would get squeezed out by people using the free parking lot as a Park-and-Ride station for the Expo light rail. He said, at minimum, the development team who is selected should plan on building at least 1,000 parking spaces. While two of the three projects have proposed building underground parking at the site, current tenants worried that the construction would be too invasive, with one tenant calling it a “threat” to the galleries there. For some in the audience, the emphasis on parking so close to the future Expo station seemed counter productive, since less parking means less of an incentive to drive. “Parking is a traffic magnet,” said Kent Strumpell, a bike advocate and Santa Monica resident to applause. “We’ve consistently heard that we want less traffic. This is an ideal opportunity to implement that goal,” he said. The City has also consolidated all information related to Bergamot Station, including the complete plans submitted by the three teams, on its website at smgov.net/bergamot. Previous articleGet Involved with the Vote Local Campaign!